Last night a questionable document surfaced out of Best Buy that was said to be an end of 2011 timeline for Verizon’s upcoming devices. The document looked super sketchy since it had a variety of misspelled words, leading many of you to question it (as did we). 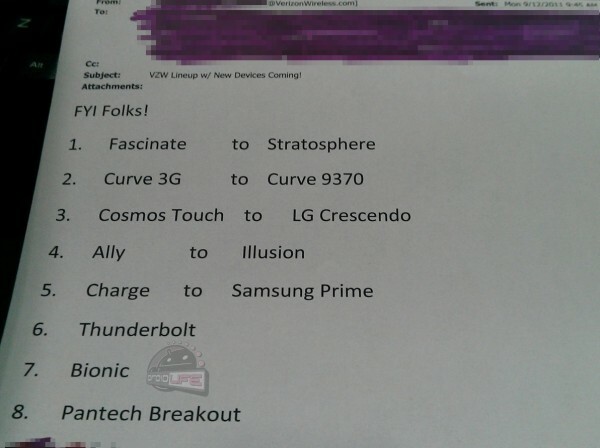 Well, we just received another document from a Best Buy employee that includes similar information, but in a much clearer and correctly spelled manner. So it’s pretty obvious to us that regional Verizon reps were given a specific set of details that they were to forward on to retail stores, this one just differs slightly. No Thunderbolt 2 (aka HTC Vigor). Doesn’t mean that the device isn’t coming by any means, but it for whatever reason did not make this rep’s list of important changes. We still have the Stratosphere as replacing the Fascinate. The Samsung Prime (actually spelled out this time) is taking over for the DROID Charge. And that’s about it. Just wanted to pass on as a second source to back up that previous story.